Being one of the most iconic office buildings in Lisbon, Torre Monsanto - a project of the architect Sua Kay - recently had a new addition, the Anexo Restaurant. With Vector Mais interior design, the restaurant stands out for the modern concept, comfortable environment and quality decorative elements. Featuring a palette of colors between anthracite gray and shades of green, combined with the natural pine wood, with the aim of relating all the space with the surrounding environment and 'play' with the textures and patterns of the various materials. Vector Mais provided all the furniture, lighting, interior and exterior carpentry. 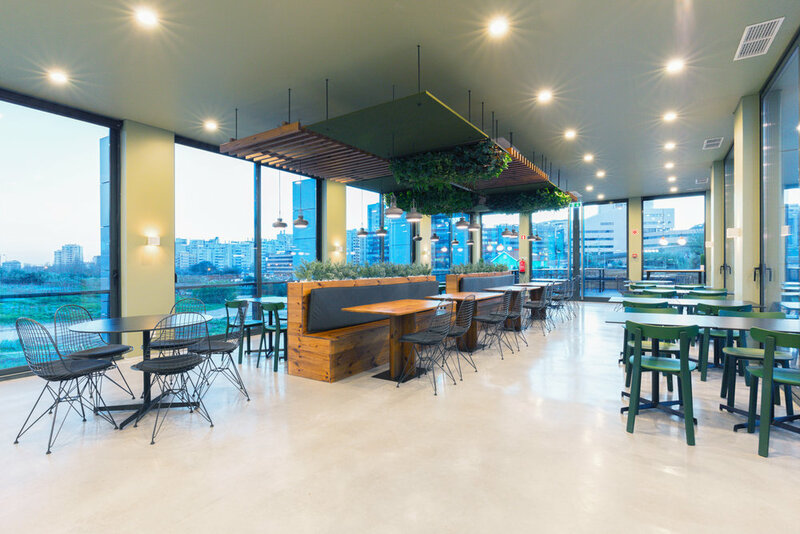 “We challenged Vector Mais to develop a restaurant space that would meet the high quality standards of Torre Monsanto and, in addition to its functional character, would be above all a pleasant space of conviviality among all those who work there daily. The result was a very comfortable space, with a great bet on the contact with green areas and with a modern and unpretentious decoration, making Anexo Restaurant a mandatory meeting point of Torre Monsanto.” Manuel Nobre, Administrator of Alcir. “The project was born of the client's desire to create a restaurant that would allow the occupants of the office building to have a quality dining space, both in the service and in the environment. Inserted in an independent module with glazed surfaces that show the generous sun exposure, the layout developed sought to promote the dynamic use of the interior space and the exterior terrace, attenuating the border between both. For this purpose, fixed carpentry pieces were designed, including high and low tables, decorative/acoustic ceilings, sofas and flower boxes, with common materials and finishes, suitable for both types of use. To complement this option, the remaining furniture pieces, lighting and plants were chosen and distributed with the same criteria, with the intention of accentuating the intended modern, comfortable and relaxed atmosphere.” Vera Lucena, Vector Mais.